The Manor is a good source of items that can be used as pet food. 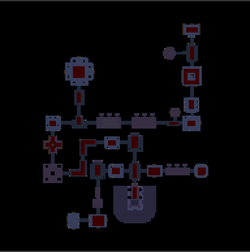 This dungeon is all about confusion, this is the place to learn and practice using the alternate keys for confusion. I hate confusion, if you have max DEF the confusion is just an annoyance. If you are not potted on DEF then you could be in trouble. There are enough minor monsters that can hurt an unpotted person quickly. Oh yeah, I forgot there is the Hell Hounds that cause bleeding and tend to gang up on you. Clear or rush your way to the boss shooting single book cases as you go, sometimes the bookcases are hiding a secret room. Secret rooms have coffins which may drop the same items as the boss. When you get to the boss a simple way to vanquish him is go in, shoot him until he turns invulnerable, then when he throws out the 4 coffins run around the room clockwise shooting the coffins avoiding those darn pesky bats. Once you make a full circle around the room, it will be time for Lord Ruthven to make another appearance. Shoot him again and repeat the process. Item Drops - St. Abraham's Wand, Chasuble of Holy Light, Tome of Purification, Ring of Divine Faith, Bone Dagger, Wine Cellar Incantation, Treasures, Death Tarot Card. This can be a very troubling dungeon for those unpotted. If you are in a small group take your time and clear. When hurt just move back to a safe area. The monsters are of the wandering type and usually won't follow you. You need to be careful of the Hell Hounds but you should be able to rush or at least move toward the boss room without having to clear out everything. Don't forget to shoot the single bookcases looking for secret rooms as you move towards the boss. Rogues - Can cloak their way to the boss minimizing the chances for confusion. Piercing classes - these types of weapons are a big help clearing out the bats, did I say I hate confusion? Huntress - spam your T0 ability to slow the monsters and specially the bats as you move to the boss. A slowed monster or boss is just easier to deal with. Knight - Its not really beneficial to chain stun the boss because his phases change quickly. Throwing out stuns can help a bit as you move through the manor to visit the boss. Trickster - using their T0 prism they can teleport and run through rooms extremely fast, and with practice and a bit of luck avoid confusion. The decoy helps slow anything that may chase him down. Mystic - The T0 orb is a big help if you are trying to rush through quickly. A longer duration orb may be better though going at a slightly slower pace by keeping the bats and other denizens in stasis as you pass through rooms.